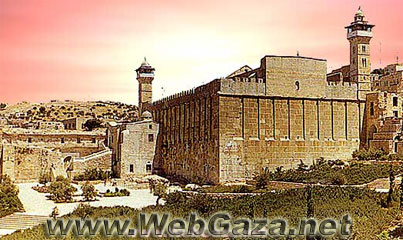 Ibrahimi Mosque (al-Haram al-Ibrahimi) - Where is Ibrahimi Mosque Located? Constructed by King Herod towards the end of the first century BC, added to by the Crusaders and the Mamluks, it is one of the most imposing of ancient Palestinian monuments. The mosque covers the Cave of al-Anbia (Cave of the Prophets) containing the graves of six prophets and their wives – Muslims believe it is too sacred to descend into and have never entered. This enclosure had a rectangular shape of 59 meters long and 34 meters width, built of large drafted ashlars, standing 18 meters high. The decorated upper part of the wall is of Mamluk origin, and of the four Mamluk square Minarets only two remain looming over the impressive edifice, those at the northwest and southeast corners. A Byzantine church was erected in the enclosure by Justinian in the late 6th century AD, but was destroyed by the Persians in the year 614 AD. The place remained in ruins until after the Muslim arrival in Palestine in 637, when the sacred place was restored into a mosque, which had attracted the veneration and care of the successive Muslim State rulers (Caliphs, Sultans and Emirs). The Haram includes minarets, domes, arches, doors, marble columns, side mosques (like al-Jawiliya), richly decorated cenotaphs covered with decorated tapestries, inscriptions. One special piece of fine work is the Pulpit that was constructed in the year 1091 for the Mashhad al-Husein in 'Asqalan, and brought to the Haram in the year 1191 by Salah ed-Deen. Since Israel occupied Hebron in 1967, the Haram has been practically controlled by Israeli soldiers, Israel changed parts of the Haram into Jewish worshipping places, and prevents Palestinians from praying freely there and very much restricted to a small area in restricted hours and day times and in restricted number of prayers that doesn't exceed 150 persons.